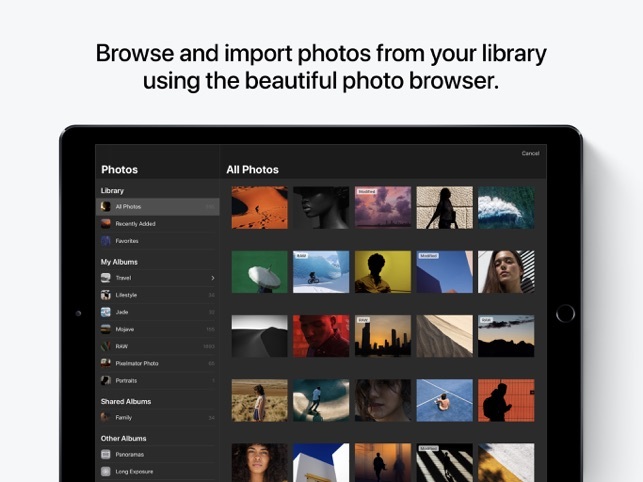 Having used lightroom on ipad as a complete replacement of the desktop lightroom classic i.e. 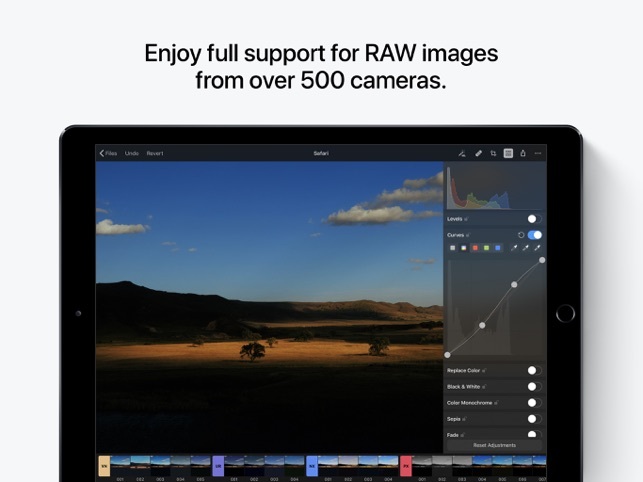 editing minimum 1000 photos (RAW) from photo shoots and providing them to the clients, the major advantage of lightroom cc on ios have been its organisation abilities (rating of the photos) and its speed. 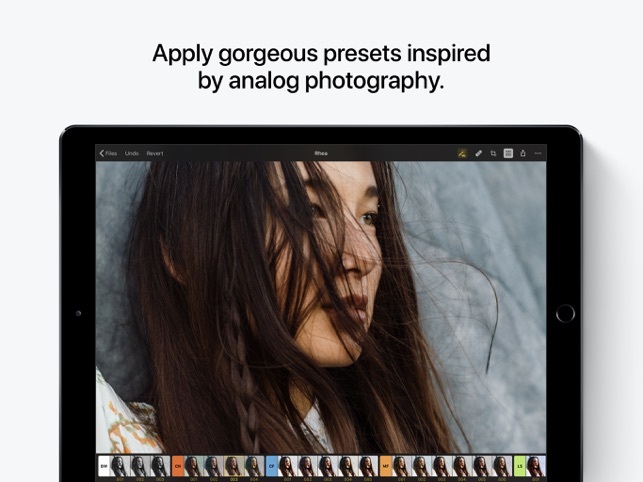 This app is very close to being this alternative to lightroom on ios but with no subscription charge, which is amazing but it still lacks some of the organisation features of lightroom - which I think is a minus. Compared to RAWpower or Darkroom, again Pixelmator is not dramatically different but it is so much quicker and smoother editing RAW files than in the apps described (Ipad pro 2017) putting it so close to be an alternative to lightroom. 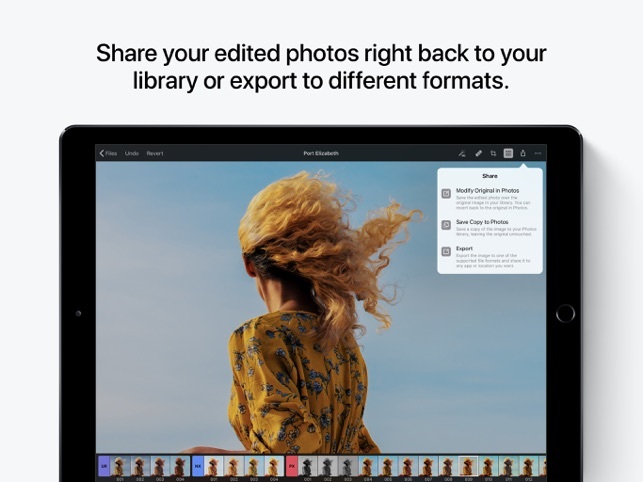 I think, if the organisation abilities of this app can be improved with easier importing from camera roll, this app would be a great lightroom cc replacement in some ways. Thanks for the review — we know the workflow side of things can definitely be improved and we'll be doing or best to focus on it with future updates. I’ve been a graphic designer for many years, and in all that time, I’ve hardly ever seen an app icon quite as hideous as this. It’s beyond awful, and looks pretty horrible on my home screen. I kinda wish I hadn’t spent money on it. So please, for heavens sake, update the icon. Commission me, if it helps, but change it either way. The disappointment doesn’t end there. 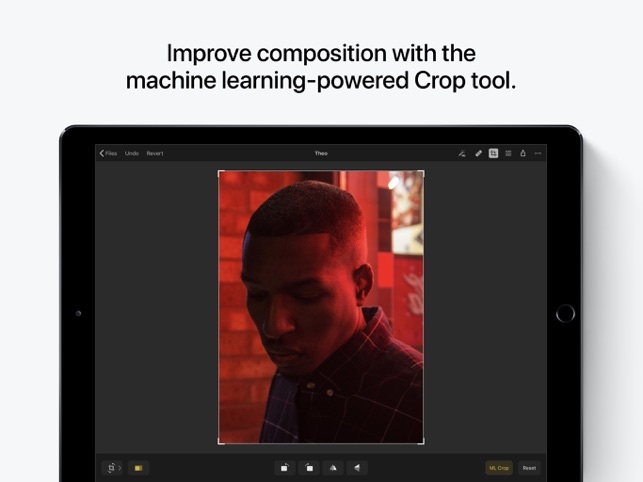 I’ve used Pixelmator products since the very beginning, and loved the powerful new tools and innovations they created, especially for iOS but also for Mac. Bringing such incredible apps to the iPad made the designers life easier. This release, however, isn’t groundbreaking or exciting. 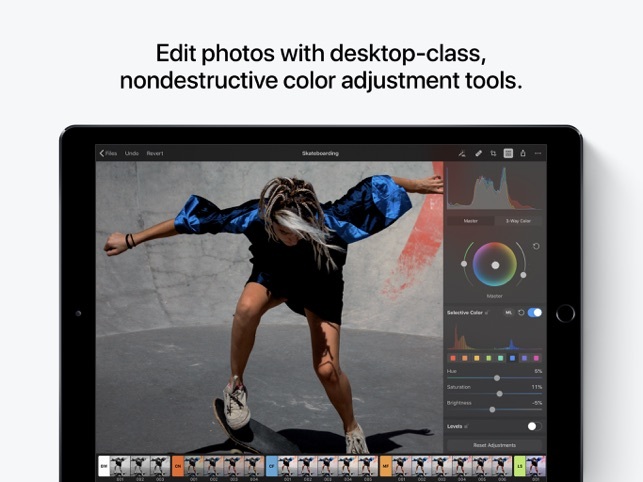 It covers many of the basic tools countless other apps already have, so such an anticlimactic release from Pixelmator is disappointing, to say the least. 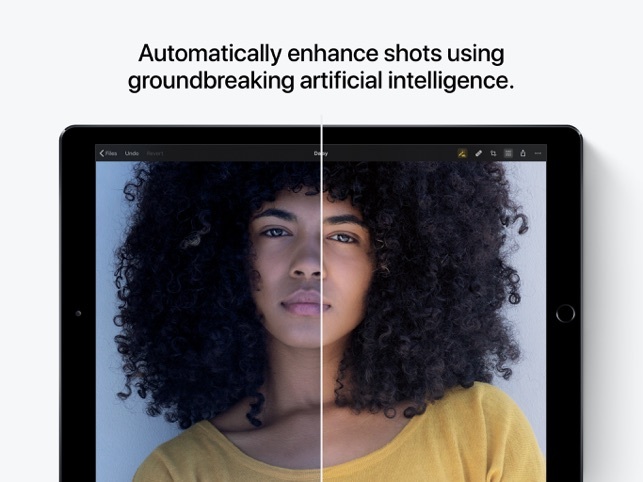 Genuinely really love the app and have been looking for an app to include in my photography workflow for ages. This really opens up some rather interesting possibilities. However, what would make it a true photographer’s best friend would be the ability to either edit directly in phosphate (this may very well be a limitation of iOS) or allow you to import a whole session from iCloud or other Cloud services and edit them (some sort of carousel view to go from one t next without the need of getting out of the editing flow). Oh and the ability to copy and paste adjustments for consistent editing would be gold. Really like his and hoping to see it developed further. Requires iOS 11.0 or later. Compatible with 12.9-inch iPad Pro, 12.9-inch iPad Pro Wi-Fi + Cellular, 9.7-inch iPad Pro, 9.7-inch iPad Pro Wi-Fi + Cellular, iPad Wi-Fi (5th generation), iPad Wi-Fi + Cellular (5th generation), 12.9-inch iPad Pro (2nd generation), 12.9-inch iPad Pro Wi‑Fi + Cellular (2nd generation), 10.5-inch iPad Pro, 10.5-inch iPad Pro Wi‑Fi + Cellular, iPad (6th generation), iPad Wi-Fi + Cellular (6th generation), iPad Pro (11-inch), iPad Pro (11-inch)Wi-Fi + Cellular, iPad Pro (12.9-inch) (3rd generation), iPad Pro (12.9-inch) (3rd generation) Wi-Fi + Cellular, iPad mini (5th generation), iPad mini (5th generation) Wi-Fi + Cellular, iPad Air (3rd generation), and iPad Air (3rd generation) Wi-Fi + Cellular.